As I’ve mentioned in the past, there’s a large and vocal group of learning pundits who are vehemently anti learning management system (LMS). They view LMS as creating inflexible learning environments where learners are provided with few choices and force fed content created by a training department. In reality, though, it’s possible to create a learning environment using a LMS that provides learners with choices over their learning activities. Although given the ability to pick the courses and learning events they prefer, these learners will still meet the learning requirements established by their workplaces or industry requirements. 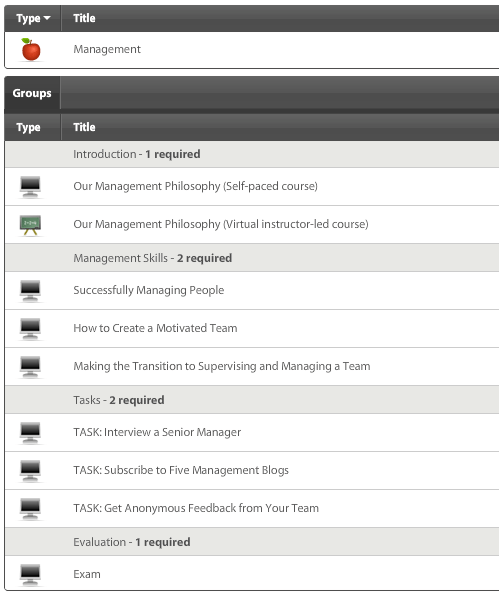 In the Introduction section of the Management curriculum displayed above, a learner can choose between a self-paced or virtual instructor-led course. There’s no need for the learner to take both courses since they contain the same content; only the learning modality is different. In the Management Skills section, the learner can take any two of the three courses listed. In the Task section of the curriculum, the learner can select and undertake any two of the three tasks listed. Finally, everyone must complete the Exam. We rarely hear complaints that universities provide rigid learning structures. After all, undergraduate university students can enroll in elective courses (darkroom photography, astronomy, children’s literature, art history, whatever) that may not be central to their core study area, yet count towards their degrees. By creating curricula that empower learners with the ability to choose courses they prefer, you can create a similar environment within your learning management system.